Self Portrait with a Cigarette. When I first clicked on this, the artist was not visible. 1. When I first clicked on this, the artist was not visible. ...I couldn't possibly have approached the depths that Beckmann knew. Were I an artist, any such self portrait of me would be silly by comparison. Thank you for this wonderful portrait. And I especially appreciate the attached explanation. This means I don't have to bother you with telling me about the painting. ...exhibition, and I will surely visit this painting, as well as Beckmann's "Departure" triptych on the fifth floor. I'll probably linger there a long time at "Departure," as I used to do when I was young and would go see Picasso's "Guernica" when it was at MOMA. (I understand why its gone, but I miss that painting enormously). "Departure" is a worthy substitute. I've been studying Beckmann for several years now, and he amazes me every time I see his work, but to see "Departure" "in the flesh" is incredible. 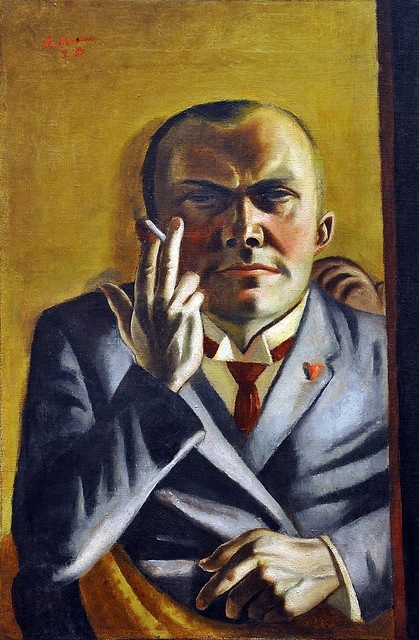 I should say that the MOMA curator's interpretation of this self portrait seems reasonable, but Beckmann himself was notoriously unwilling to "explain" his paintings, as was Picasso. Of Guernica, asked to explain the horse and the bull, Picasso said, "One is a picture of a horse, the other is a picture of a bull." Asked to explain "Departure," Beckmann told the owner of the painting that if he needed an explanation, he should send the paintings back. Beckmann is one of the greatest artists of the 20th century, much underrated, often ignored, although appreciation of his stature is certainly rising. I was lucky, I guess, to grow up on Long Island, and after many years in California, to come back east to that sometimes maligned but mostly wonderful State of New Jersey. Regrettably I don't get to go as often as I would like, or as often as I did when I was young, but it is a privilege to live near that great city, New York. You'd need a week at least to see it all. ...and what a great week that would be. One of the great things that happened during my last visit was my son seeing Dali's crucifixion for the first time.